To evaluate the efficacy of docetaxel, cisplatin, and 5-fluorouracil as combination chemoradiotherapy (DCF-RT) for cervical esophageal cancer (CEC), we performed a retrospective analysis of CEC patients treated by DCF-RT at a single institution. We conducted a single-center retrospective study. Twenty-one patients with CEC who underwent DCF-RT between 1999 and 2017 at our institute were included in this study. 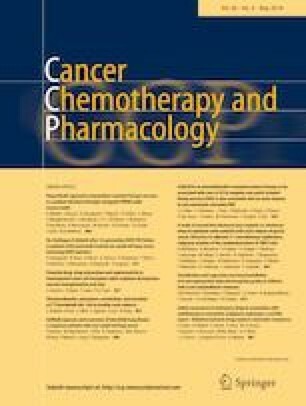 Chemotherapy consisted of intravenous docetaxel at 50 mg/m2 on day 1, intravenous CDDP at 60 mg/m2 on day 1, and intravenous 5-FU at 600 mg/m2 on days 1–4, repeated every 4 weeks for two cycles. Among the 21 patients, six were irradiated using three-dimensional conformal RT (3D- conformal RT) and 15 were treated using intensity-modulated RT (IMRT) consisting of 60 Gy in 30 fractions. The median follow-up period was 49.6 months (range 4.6–97.6). The overall complete response (CR) and local CR rates were 61.9% and 81.0% for all patients, and 76.9% and 84.6% for patients without hypopharyngeal and/or thoracic esophageal invasion, respectively. The 3-year overall survival (OS), progression-free survival (PFS), and local failure-free survival (LFFS) rates were 79.6, 52.4, and 74.7%, respectively. Grade 3–4 leucopenia developed in 12 patients (70.6%), neutropenia developed in 13 patients (81.2%), and mucositis developed in 2 patients (9.5%). There were no treatment-related deaths. The 3-year OS and LFFS of patients who underwent DCF-RT were higher than those in the previous studies. Although the high rate of myelosuppression requires careful management, DCF-RT is a safe and effective modality for CEC.